Istanbul (AFP) - Tens of thousands of women took to the streets across Turkey on Wednesday, marching for women's rights while some also rallied against expanding the president's powers. 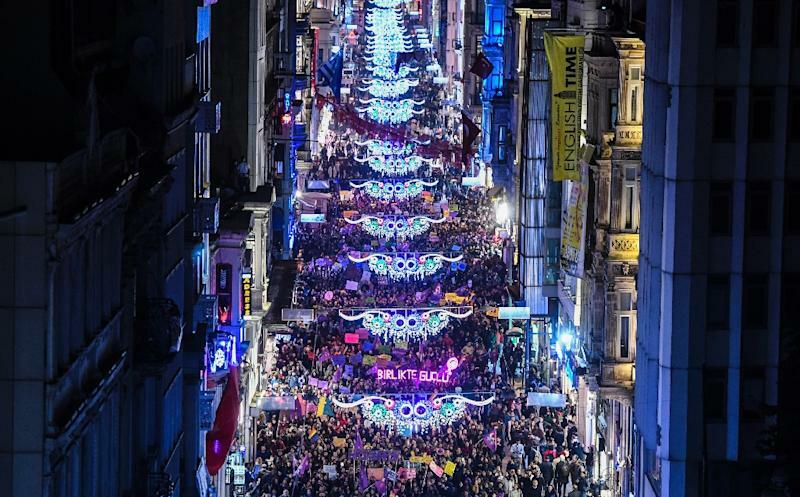 In Istanbul over 10,000 people, mostly women, walked the long Istiklal Avenue, chanting "end male-perpetrated violence" and "Tayyip, Tayyip, run, run, we are coming". "Tayyip" refers to the Turkish President Recep Tayyip Erdogan who is seeking to create an executive presidency which would see the post of prime minister abolished. On April 16, the Turkish public will vote on whether to change the current system which the government argues causes instability while critics claim greater powers for Erdogan will lead to one-man rule. 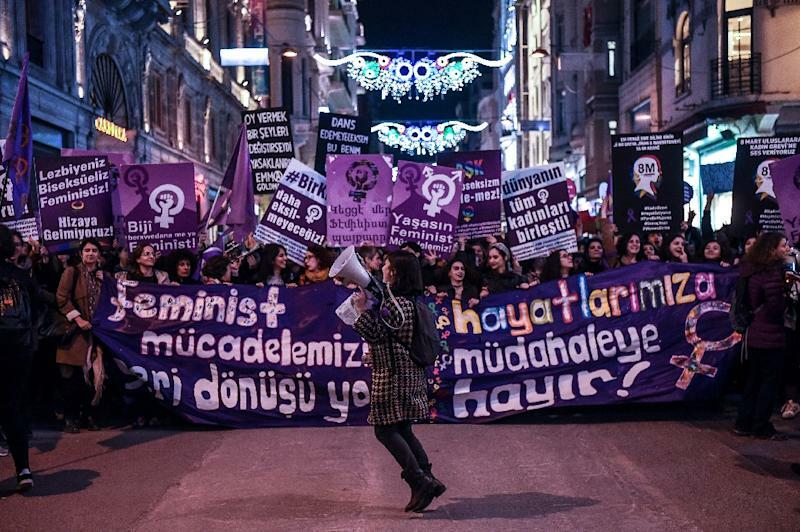 A deep purple dominated the colourful crowds in Istanbul who held placards saying "women are free" and "we are strong united". The march was organised by multiple women's rights groups and attendees included LGBT individuals, young women, students and also men -- many of whom were carrying "No" posters. For Nurten Karanci who attended the march, being a woman in Turkey means a "fight to live, to survive". Last year, a woman was attacked in Istanbul for wearing shorts on a public bus while another woman wearing the Islamic headscarf said she was kicked and insulted last month. Women's activists often call for an end to violence against women in a country where hundreds of women are killed every year, often by their husbands. Despite a heavy police presence and water cannon trucks on standby, the Istanbul march took place peacefully as they walked from the popular Taksim Square to Sishane on the other end of the avenue on the European side of Istanbul. Members of the pro-Kurdish Peoples' Democratic Party (HDP), whose two co-leaders remain under arrest accused of terror links, also took part of the march in Istanbul. Meanwhile in Ankara women hit tambourines and held "No" posters shouting their opposition to giving "one man" all the power. In the Kurdish-majority southeastern city of Diyarbakir, hundreds of people staged a demonstration for women's rights, dancing and playing music. One participant, Sabiba Akgul, said all women "should stand up and support each other. Hand in hand, they will find freedom". Activist Ozlem Gul in Istanbul described the difficulty of being a woman in Turkey. "Being a woman anyhow is very complicated, especially today. We have to fight against many things. We have to fight against the attacks on our bodies, our work, our opinions. "We are in the streets, we won't let up, and we will keep on the fight as Turkish women."